Magic squares are one of the simplest forms of logic puzzles, and a great introduction to problem solving techniques beyond traditional arithmetic algorithms. Each square is divided into cells, and the rules require that the sum of any row, column or diagonal in the square be the same. Given a magic square with empty cells, your job is to solve the puzzle by supplying the missing numbers. 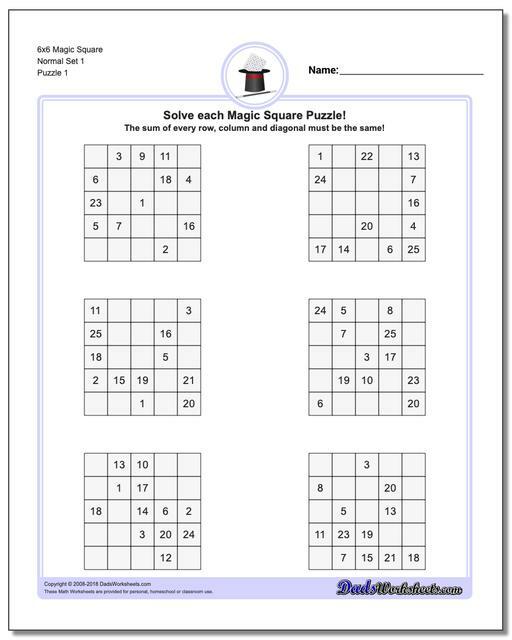 This page has 3x3, 4x4 and 5x5 magic square worksheets that will get you ready for other challenges like the printable sudoku puzzles and more! 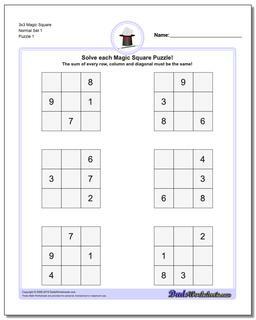 These harder 4x4 magic squares are step up from the 3x3 puzzles, but still fairly easy to solve if you have been practicing your addition worksheets. The normal squares with values 1-16 are easy to solve, but the non-normal squares may need your calculator! Normal 5x5 magic squares have numbers from 1-25 and can be a real brain twister. 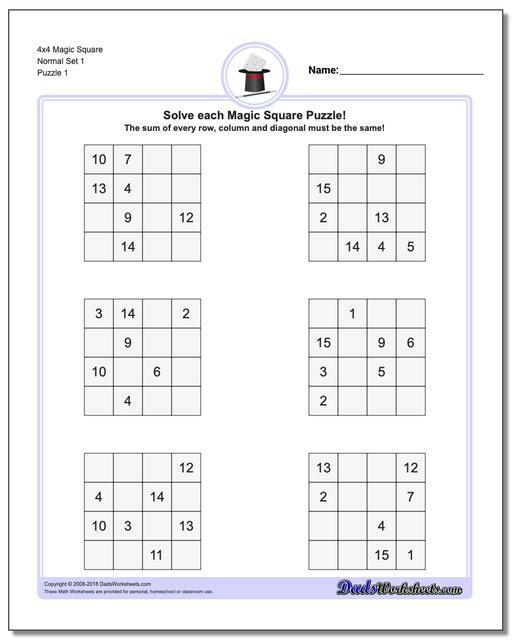 The non-normal versions of the 5x5 puzzles are great exercises for kids (or adults!) who have solid problem solving skills. 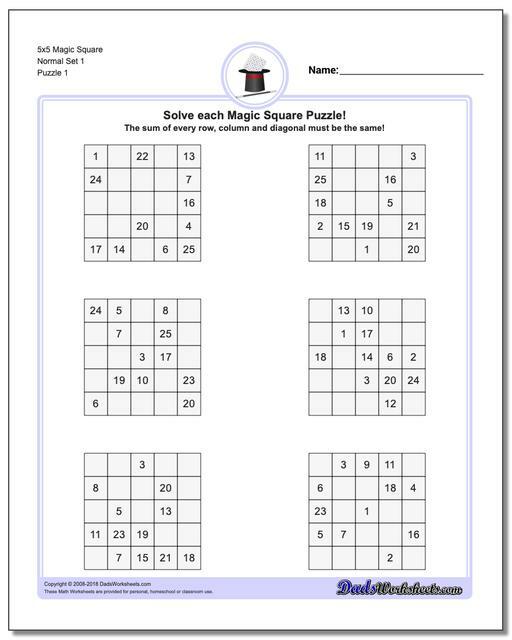 Thse worksheets start with normal 6x6 magic squares having numbers from 1-36, but the non-normal versions of the 6x6 puzzles are tremdously difficult to solve and will likely require your calculator and some time. 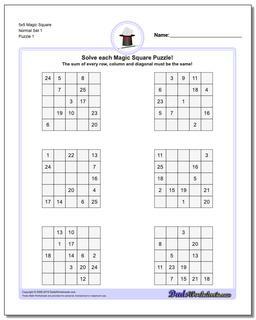 Try These Printable Magic Square Puzzle Worksheets! Magic square puzzles are one of the earliest types of number puzzles, dating from the 6th or 7th century BCE. 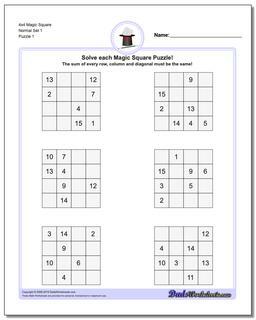 We find early records of magic square puzzles coming from China and Arabia. 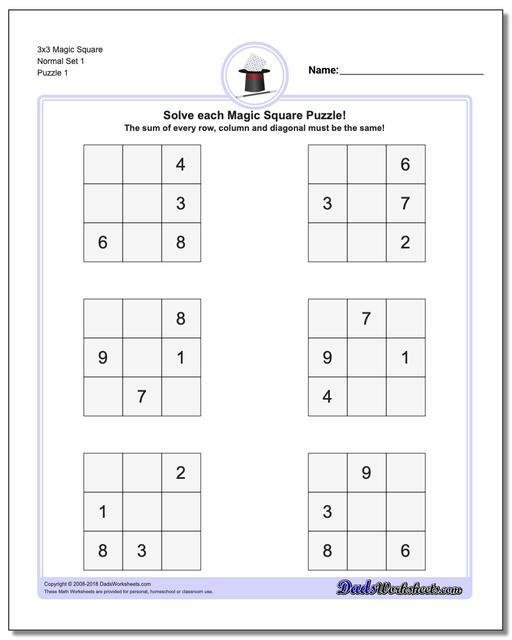 Other puzzle types, including sudoku, require similar skills to solve, making magic square puzzles a good introduction to the broader class of missing number logic puzzles. A magic square has the property that the sum of the numbers in every row is the same value, and also the sum of the numbers in every column is that same value, and also the sum of the two diagonals is that same value. When solving a magic square puzzle, some of the cells will be blank and your challenge is to figure out what numbers go into those cells to make all of the row, column and diagonal sums equal. A magic square is considered 'normal' if the square contains numbers that are the smallest possible values. For example, a 3x3 magic square has nine cells and a normal 3x3 magic square will only contain the numbers 1-9 in it. Similarly, a 4x4 magic square with 16 cells contains only the values 1 through 16, and a 5x5 magic square only contians the values 1 through 25. A non-normal square does not use minimal numbers in its cells, so the sums of the rows, columns and diagonals may be larger. What is the Order for a Magic Square? The Order for a magic square dimension of the horizontal and vertical axis of the square. Because it's square, these values for a given puzzle are the same. For example, for a 3x3 magic square we say it is an 'order 3' magic square. A 4x4 magic square is order 4, a 5x5 is order 5 and so on. What is the Magic Constant for a Magic Square? The Magic Constant is the value that you get for each row, column or diagonal sum in a magic square. For a normal magic square, a curious property is the magic constant for a normal magic square of a given order is always the same. The magic constant for a order-3 normal magic square (a 3x3 magic square) will always be 15. Similarly, order 4 normal magic squares will always have a magic constant of 34, order 5 normal magic squares will have a constant of 65 and order 6 normal magic squares will have a magic constant of 111. These constants will come in handy when solving the normal magic square puzzles here!